These units extend vertically and extendable platforms allow limited horizontal reach. 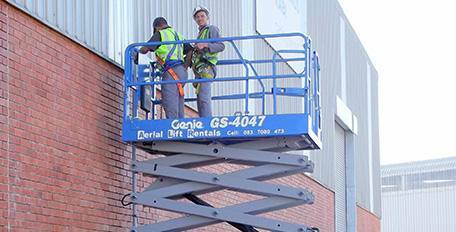 They are self-propelled, driveable at full elevation and are ideal where less reach and height but more workspace and lifting capacity are required. The smaller units will fit through standard doorways and narrow aisles. They are powered by batteries which are recharged from standard 220v outlets, making them silent and emission-free. Stability is achieved by means of counterweights and tilt sensors.